It’s spring. The birds say so. Earlier this week I was startled by the sound of loud popping noises that sounded like they were coming from just outside my window. When I walked toward the sound of the noise, they began again – and it was clear that rather than something sinister, the popping was caused by a confused woodpecker of some kind trying to break into my house via the skylight. He failed, thankfully. But obviously, if the glorious weather we’re having right now wasn’t enough of a sign, the woodpecker reminded me – spring is here. This morning, just as I sat down at my desk, I heard a thud on the office window next to me. I turned to see a dazed bird flying away, and got up to see if it had actually made it or was lying on the pavement. 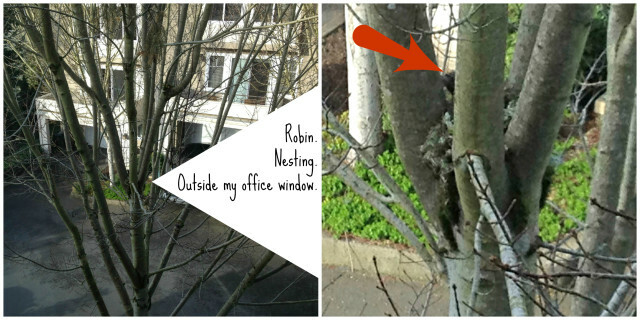 There was no wounded bird in sight, but that’s when I noticed a robin in the tree outside the window, busily building her nest. These photos are bad – they’re taken with my phone, and there’s a pesky tree branch blocking most of the nest from my vantage point – but I’ve been watching her for the last half-hour, and she’s definitely nesting. On the left is what I can see from my office window. On the right is as zoomed in as my phone will go, with the red arrow pointing to the robin’s tail as she was – I’m guessing here – fluffing pillows or something. Ordinarily, my favorite part of having this tree outside my window is when it’s bursting with color. But this year, I’m really hoping the leaves stay away for awhile yet. I want to see some baby birds. Oh, social media – you never fail to delight. I woke up this morning to find that Robin Leach’s official Twitter account had sent me a message. Yes, that Robin Leach. Mister Lifestyles of the Rich and Famous, Mister “champagne wishes and caviar dreams.” And I am neither rich nor famous, indulging on neither champagne nor caviar on a regular basis. So, yes, I was a little surprised – until I realized he’d made the same mistake other Twitter users all over the world have already made, thinking the @andiamo in my name is that of a restaurant or club. While I'm amused to have @Robin_Leach tweet at me, I am not, in fact, the restaurant where the guy from Pawn Stars went with his girlfriend. @andiamo glad to have amused you but sorry for the incorrect @ name Hope u didn't get too many people trying to hock their belongings. 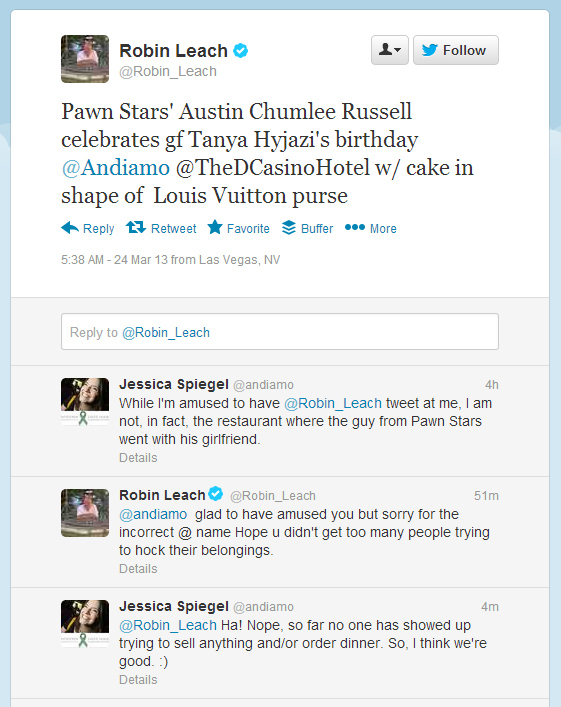 So, today, Robin Leach and a mistake on Twitter have served to amuse me to no end. And that certainly isn’t what I was expecting from my Sunday. Now, should I take this as a sign to have champagne and caviar for lunch? I saw this quote on a friend’s Facebook page not long ago, and immediately fell in love with it. I, too, want words for complex emotions. Perhaps we should just create them? I know I just posted a quote that made me sit up and take notice, but I’ve got another one to share. I can’t even explain why this one jumped out at me so much, since when you read it you’re thinking, “Well, duh.” But somehow? Somehow it’s a concept that most of us forget (or ignore) too easily. There are a few more quotes on this page of Colin Wright’s site that I liked, but this was the quote that, when I saw it on Pinterest, led me to hunt down the author in the first place. So. 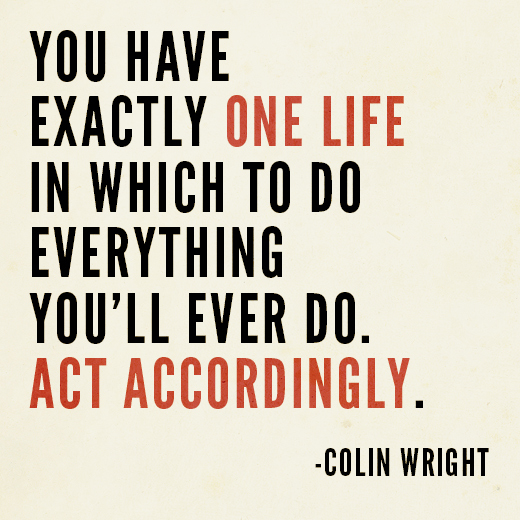 What are you doing today with your one life? I like quotes. I know not everyone does, but I do. I love ’em. I’ve got books full of quotes that meant a great deal to me as a teenager that make me cringe a little now, but that’s the beauty of such collections – they double as time machines. At any rate, this quote, posted today on Twitter by Rand Fishkin of SEOMoz from this blog post, is one that resonates with me right now. I’m guessing you’ll understand why. I’m not giving up. Quite the opposite. As ugly and awkward as it is to take three strikes and refuse to walk away from the batters’ box, I plan to keep throwing myself against the wall of technology and behavior change and making life better until something gives. 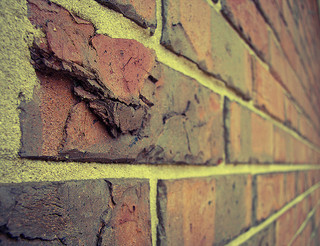 Either my head’s gonna crack open or the brick’s gonna start chipping. What’s inspiring you to take the next step forward today? Tender & foreboding, & applicable to pretty much anyone who is naturally gifted at anything.